Skip the base four in favor of the bigger 2.4-liter engine. Gas mileage isn't that much lower, but the driving feel is much improved. 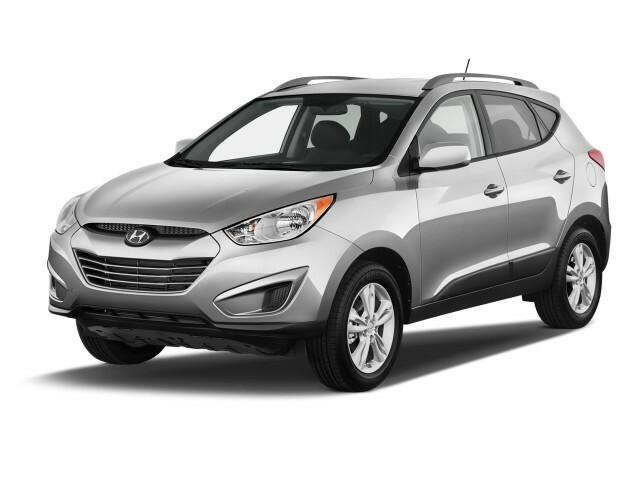 Rich in value and interesting styling cues, the 2013 Hyundai Tucson's a pint-sized crossover that completely avoids SUV cliches of size and looks. The Hyundai Tucson is a prime example of why crossovers have stolen the hearts of suburban families away from the traditional SUV. It's smartly-conceived, sharply styled with some of the Sonata's design cues, and it's relatively fuel-efficient–though its EPA ratings have been adjusted downward for accuracy. The Tucson was well timed and well placed in 2010, when it emerged with a fresh look and fresh running gear. The Tucson still looks dramatic and interesting, going on five years later. We're still not sure exactly what's "Tucson" about its urbane new shape, but there's so much surfacing and detailing on its body...wait, what were we saying? 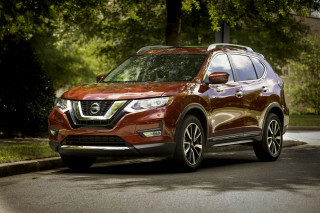 It's attractive still, and grabs more attention than a similarly sized Nissan Rogue or Acura RDX. The brash looks launched Hyundai's brand-wide redesign, and for every Sonata or Elantra that came after it, the Tucson seeded the ground. Inside, there's a large LCD screen and vertical blades of metallic trim that slice the dash into sections of low-gloss, tightly grained black plastic, just slightly less audaciously than the sheetmetal. There's no turbo or any six-cylinder offered with the Tucson--two four-cylinder engines are it, as far as engines go. The base 2.0-liter four and its 165 hp are a price leader in most every sense, so stick with the 2.4-liter four, though you won't have the option of a five-speed manual--it's six-speed automatic only. Fuel economy is almost as good as with the smaller-displacement engine, and the bigger four moves the Tucson at a decent clip, without much noise or vibration. Neither version is quick, per se, while the similar Kia Sportage gets a robust, turbocharged four, but the Tucson's a respectable straight-line performer. Handling is predictable, and the Tucson rides better than it steers. The slightly firm, settled ride on higher-end versions comes to base versions this year, in the form of more sophisticated shocks and retuned bushings. While the road manners are much better than the last Tucson, the engine-speed-sensitive electric power steering is a weak spot. It brings with it a small turning circle, great for parking-lot squeezes, but the steering feel isn't as linear as the better electric systems from VW and Ford, and there's little direct feedback from road surfaces. The Tucson earned the IIHS' Top Safety Pick award for 2012, and the NHTSA gives it four stars overall. Curtain airbags and stability control are standard, while Bluetooth and a rearview camera are available. Visibility is an issue in the Tucson: its heavily styled rear end has thick pillars and less glass than, say, a CR-V.
All versions have standard power windows, locks, and mirrors; cloth seats; remote keyless entry; air conditioning; and an AM/FM/XM/CD player with USB port. The options list has as many upscale features as some entry-luxury sedans. There's Bluetooth; telescoping steering; leather seating; heated front seats; steering wheel audio controls; a power driver seat; 17-inch wheels; automatic headlights; and dual-zone automatic climate control. More expensive options on the Tucson include a panoramic sunroof; premium audio; and a touchscreen navigation system fitted in tandem with Bluetooth streaming stereo audio and a rearview camera. Go whole-hog on the options, and the Tucson can reach $30,000. With one of Hyundai's most daring shapes, the Tucson is out there on the styling ice. Hyundai's been giving all of its vehicles a total makeover, and the transformation couldn't be more dramatic for the compact Tucson. It truly says farewell to Hyundai's plainer past and wears the "fluidic sculpture" look well, as does most of the lineup at this point--including the new Accent and Veloster. Hyundai hits the same global high note with the Tucson's cabin. The interior's just a shade less dramatic, with a big LCD screen and vertical blades of metallic trim knifing into bands of tightly grained, low-gloss black plastic. There are better-finished interiors in this class, but it's still a standout design. Powertrains are smooth and good on gas, but the Tucson's not very quick, and steering feel is lacking. Since it's among the smallest crossovers on the market, the Tucson's four-cylinder engine lineup makes sense. 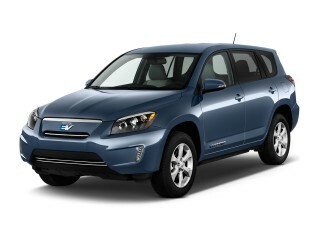 However, we'd recommend only the larger four, though the smaller-displacement engine yields better gas-mileage numbers. 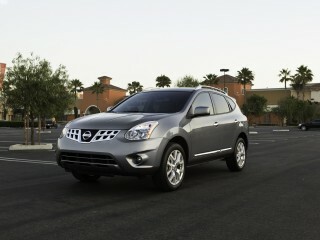 The base engine is a 2.0-liter four that makes 165 horsepower. 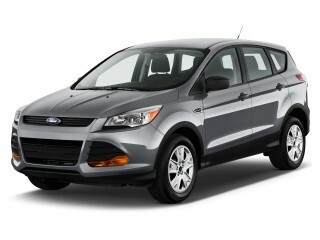 It's paired with either a six-speed automatic or a five-speed manual transmission. It's a lower-cost option that keeps the Tucson's base price in sight for some buyers, but in our opinion, the 2.4-liter four-cylinder is the better choice. It's more powerful, at 176 hp and 168 pound-feet of torque, and feels much stronger, though it doesn't suffer much of a gas-mileage drop in real-world combined ratings. We've driven the available manual transmission and it's a likable gearbox, with a light lever and clutch uptake, but you're unlikely to see many on dealer lots. The six-speed automatic is very smooth and actually more efficient. 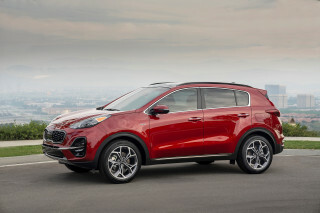 The turbocharged four you'd find in the related Kia Sportage isn't offered in the Tucson but straight-line performance is acceptably average, with enough reserve power for passing with the larger 2.4-liter four. Ride quality is better than steering feel, and the Tucson's handling has a predictable feel. All versions now have a common set of shocks and bushings that yield a slightly firm, settled ride. While the road manners are much better than the last Tucson, the new engine-speed-sensitive electric power steering is a weak spot. It brings with it a small turning circle, great for parking-lot squeezes, but the steering feel isn't as linear as the better electric systems from VW and Ford, and there's little direct feedback from road surfaces. We're also not fans of the mushy, not-so-communicative feel of the brake pedal. On the small side of crossovers, the Hyundai Tucson gives adults just enough room in its back seat. With more interior space than a Nissan Rogue or the old Ford Escape, the Hyundai Tucson even has more people and cargo room than the Acura RDX luxury crossover. 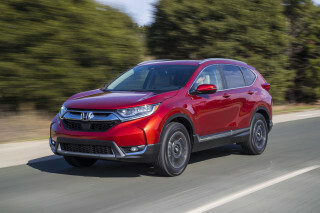 It's considerably smaller than the Toyota RAV4 and Honda CR-V, making it a subcompact, though its long wheelbase (longer than the Escape and CR-V) gives it a more spacious feel inside. The front passenger space affords a good amount of head and leg room. The seats themselves have good back support, but the bottom cushion is short and tilts down a bit too much, which can become uncomfortable on anything more than a short drive. 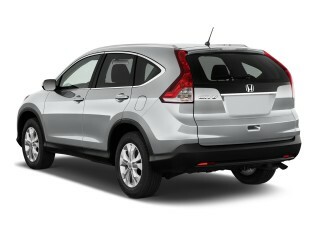 The back seats are more supportive, and two adults will fit easily. The cloth seats are the better bargain in either case--the leather seats seem to have less shapely designs, and the cloth ones are grippy enough, with a low-maintenance fabric that's of a high-enough quality. Safety scores have been good, and the Tucson offers some safety options its competition hasn't. Though one agency hasn't updated its ratings yet for 2013, the Hyundai Tucson's fared well in crash tests to date. 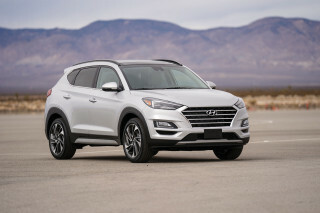 The insurance industry-funded Insurance Institute for Highway Safety (IIHS) named the Tucson a Top Safety Pick in the 2012 model year, with its top "good" score in all tests. However, it hasn't put the finishing touches on its latest scoring. We'll update this page when that information becomes available. Meanwhile, the National Highway Traffic Safety Administration (NHTSA) has renewed the Tucson's overall score of four stars, which rolls up its four-star score on frontal impact protection and rollover resistance, and a top five-star score in both the side impact and side pole tests. The Tucson covers all the usual bases for safety-conscious shoppers. Dual front side and curtain airbags are standard, as are anti-lock brakes, traction and stability control. Hill descent control is also standard, along with brake assist, tire pressure monitors, and active headrests. Bluetooth is standard on most versions, and a rearview camera is available. All-around visibility int he Tucson is quite good, save for some spots at the rear quarters, where the dramatic roofline meets its tailgate. There's no budget feel in the Hyundai Tucson's standard features set, or on its options sheet. A fairly well-equipped vehicle for its price point, more so when compared with some of the other small crossovers, the Hyundai Tucson comes with standard features that include air conditioning; power windows, locks, and mirrors; remote keyless entry; cloth seats; and an AM/FM/XM/CD player with a USB port. On the GLS edition, automatic headlights, fog lights, and heated front seats have been added as standard for the 2013 model year, and on Limited versions, pushbutton start is included for free this year. The options list has as many upscale features as some entry-luxury sedans. There's Bluetooth; telescoping steering; leather seating; steering wheel audio controls; a power driver seat; 17-inch wheels; and dual-zone automatic climate control. More expensive options on the 2013 Tucson include premium audio; a panoramic sunroof; and a touchscreen navigation system that's paired with Bluetooth streaming audio and a rearview camera. 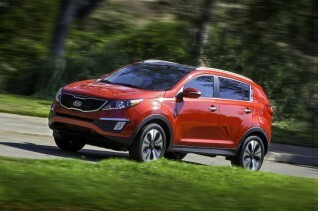 Given free rein on the options list, and a spendy Tucson shopper can tach up the price tag to $30,000. The Tucson's standard warranty coverage is among the best in the class, with its five-year/60,000-mile, bumper-to-bumper coverage and its 10-year/100,000-mile powertrain coverage. Gas mileage is good for the class, though the Tucson isn't quite as good as Hyundai's best sedans. 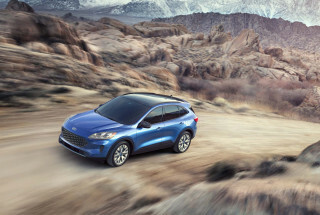 The Tucson was one of the first vehicles to benefit from the focus on gas mileage, and though it hasn't gained any more miles per gallon since it was new in 2010, it's still competitive with the other leaders in the subcompact-crossover class. The base Tucson is rated by the EPA at 22/29 mpg, for its combination of a 2.0-liter four and a six-speed automatic gearbox. With a rarely seen five-speed manual transmission instead of the automatic, the same engine delivers 20/26 mpg. With the larger, more powerful 2.4-liter four-cylinder, the Tucson gets 21/29 mpg (manual) or 21/30 mpg (automatic). Adding all-wheel drive drops those numbers by 1 to 3 mpg. Hyundai says it's been able to improve fuel economy by reworking all of its vehicles with lighter construction techniques, and by improving all of its powertrains. NOTE: The Tucson is among those Hyundai vehicles included in a restatement of fuel-economy figures. From the 2011 to the 2013 model year, the EPA has calculated that many Hyundai vehicles had overstated gas-mileage ratings that did not hold up to confirmation testing performed by the agency. Our corrected figures include a mix of updated EPA numbers and figures provided by the EPA for 4WD manual-transmission models that have not yet been retested. Owners will receive reimbursements for extra fuel used, and can initiate payment through Hyundai's site, www.hyundaimpginfo.com. This is my 3rd Hyundai (2 Sonatas and the Tucson). My husband also drives the Vera Cruz (sadly, out of production ). Very reliable, great service, unbelievable warranty, average riding comfort (it is a truck... This is my 3rd Hyundai (2 Sonatas and the Tucson). My husband also drives the Vera Cruz (sadly, out of production ). Very reliable, great service, unbelievable warranty, average riding comfort (it is a truck, after all). I switched to the Tucson to get more cargo room but I miss the nicer features, not offered in this model. I wish they would put in the auto lift on the hatch. I would trade in for that one feature!